Yellow Bellies - great big horrible jelly and foam snakes, made by our pals at Haribo. Disgusting to look at. Nice to eat! - Qty In Order: a quarter of a kilogram - just over 8.8 ounces... More.. Scary Jelly Skeletons - big juicy jelly skeleton sweets. Frighteningly good!!! - Qty In Order: a quarter of a kilogram - just over 8.8 ounces... More..
Vampire Teeth - Deliciously life-like gummy vampire teeth - great for playing tricks on people, and even better for chomping on! - Qty In Order: a quarter of a kilogram - just over 8.8 ounces... More.. Giant Rats - massive juicy horrible ugly jelly rodents. 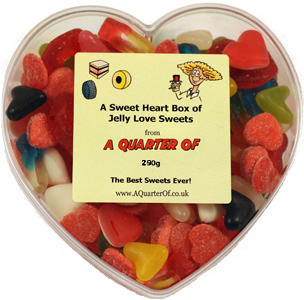 - Qty In Order: a quarter of a kilogram - just over 8.8 ounces... More..
A Sweet Heart of Jelly Love Sweets - A fabulously original romantic gift that will make your beloved swoon with love and adoration. Alternatively, it can be used as colourful table decorations at your wedding (or favours, if your budget allows!). ... More..
Jelly Bugs - A whole plethora (good word!) of bugs made of fruity tasty jelly.... they`re delicious! We have spiders, bees (or are they wasps? ), snails, maggots, caterpillars... eeeeeeeugh!!! Tasty insects galore!!!!! - Qty In Order: a quarter of... More..
Baby Dolphins - Aaaaah - weeny little baby dolphin jellies that taste of fruit. A very sweet and totally moreish aquatic addition to our Insects and Animals section (expanding all the time - A Quarter Of is turning into Noah`s Ark!) - Qty In Order: ... More.. Giant Tongues - We're simply lost for words... other than... HOW BLINKING GREAT ARE THESE??? Great big (comparable to normal tongues we'd guess) strawberry flavoured jelly tongues! Just fantastic! The possibilities are endless for fun and hillari... More..
Barratts Jelly Babies - Not made by Bertie, but we can`t tell the difference in the taste. For some of you, it`s Bassetts or nothing, but for others, a Jelly Baby is a Jelly Baby - so we thought we`d give you the choice! - Qty In Order: a quarter ... More..
Jelly Filled Brains - You may think `mmm... why would I want to eat a brain?` Well here are three jolly good reasons: 1. They`re really scrummy - a fruity gummy (firmer jelly) exterior containing a delicious layer of soft strawberry jelly. 2. Eating ... More..